Looking for a delicious and easy vegetarian dinner? Look no further than this amazing and hearty pasta. 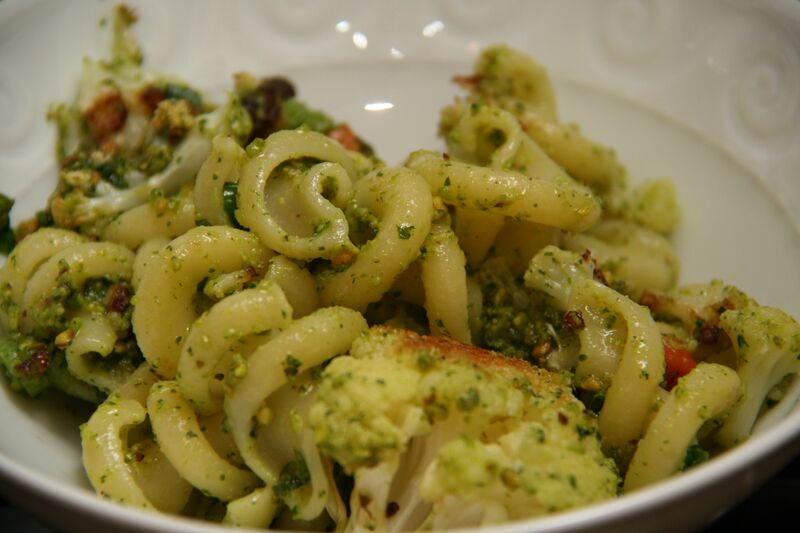 A delicious pesto — made from cilantro and pistachio — pairs well with the roasted cauliflower and carrots tossed in with the pasta. So much flavor! The interesting thing about this pesto is that it contains no cheese. It gets its richness from the nuts. Though, I must admit I enjoyed my pasta with some parmesan sprinkled on top. Fine Cooking suggests an alternative recipe with broccoli and red peppers instead of the cauliflower and carrots. Can’t wait to try that variation! Position a rack in the center of the oven and heat the oven to 475°F. Bring a large pot of well-salted water to a boil over high heat. Put the cauliflower and carrots on a heavy-duty rimmed baking sheet. Drizzle with 2 Tbs. of the olive oil and 1/2 tsp. salt and toss to coat. Roast for 10 minutes, stir, and continue roasting until tender and golden in spots, about 10 minutes more. Meanwhile, pulse the cilantro, pistachios, and garlic in a food processor until finely chopped. With the machine running, add the remaining 5 Tbs. oil and purée until the sauce is very smooth. Add the lemon juice and 3/4 tsp. salt and pulse to mix. Boil the pasta according to package directions until al dente. Drain well and return the pasta to the pot. Toss the warm pasta with the roasted vegetables and pesto. Season to taste with salt and pepper and transfer to a serving bowl. Sprinkle with the scallions and serve.